Yes it does appeal to an existing bias I have; APPLE BAD, everything else (except adobe) good. I really hate Apple, but don't get me started. I had a look at this article and like it on the outset, but thinking about it I don't agree with it for a few reasons. There is likely a lot of crossover between OSX and the iPhoneOS, between AIR SDK and AIR itself (it is odd that they list the Air SDK & Compiler separately). There is also the issue of simply counting vulnerabilities as a measure of badness. One vulnerability doesn't equal another, if one of those vulnerabilities allows a bad guy to remotely take control of your computer and the other simply allows them to crash your browser, then the first is much worse. So I thought I would do a more detailed analysis to see what is up and maybe confirm my hatred that Apple is terrible. The CVEdetails site gives each vulnerability a score (CVSS), from 0 being minor/non-existent issue to 10 being a critical issue. I decided to show a different side of that article. One that would show the scores more importantly and thus give us the OS with the worse security score. I will focus on OSX and Windows7 to narrow the field. I'll do Android and iPhone OS in the next blog post. 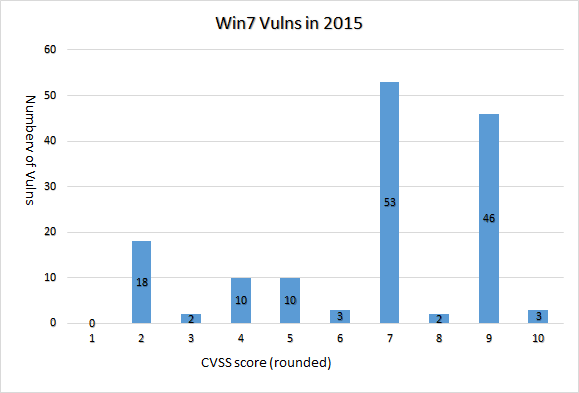 Let's look at these vulnerabilities that scored 10. An interesting vulnerability, but not many people should be running telnet on their windows7 PC, let alone then exposing this to the internet. Was a bad one, that allowed you to crash a webserver, though the IIS on windows 7 doesn't run as a service and is connection limited at windows XP's IIS and Windows Vista IIS was. Essentially allows an attacker to execute code on your machine via a vulnerability in remote desktop, not likely that this is enabled through your router, but it is an issue for a malicious insider as it is enabled by default to some extent in corporate environments. I don't think these vulnerabilities should all be 10 (say 9.x?). Yes they allow a remote attacker to take control, but they require a kind of perfect storm. They require the Windows7 machine to have these services enabled (Telnet and IIS are not installed by default, RDP is installed but disabled), and if the attacker is on the internet these also need to be open on the victims router/firewall, or an attack chained to include attacking the UPNP natting that some home routers do. Now lets look at Apple's MACOSX. 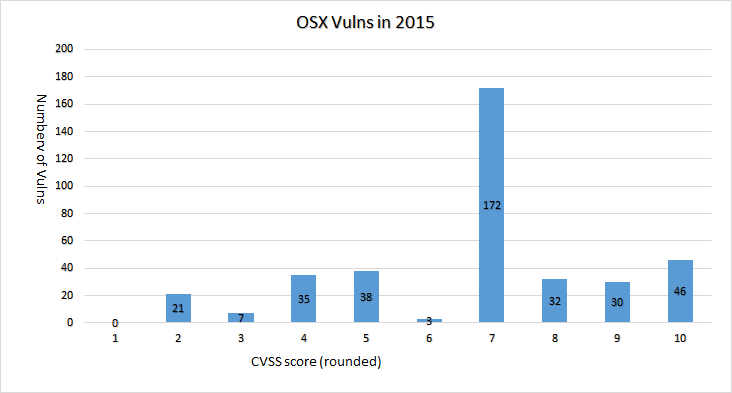 OSX had 384 vulnerabilities in 2015, with a lower average than Microsoft at 6.76. This is likely due to their being more vulnerabilities reported. It could also be that Microsoft seemingly score and report their own vulnerabilities and thus are harsher on themselves. There is also the issue that a lot of the OSX vulnerabilities are due to included open source software and thus these libraries etc get reported by their maintainers (ag Apache, PHP etc). 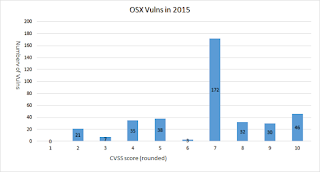 Some of the higher rated vulns I noticed where Apple only, and only reported on their support pages or lists. Looking at that we can see there are simply so many more 7, 4 and 5 rated vulnerabilities, which is what brought the average down. I had a look at the standard deviations using the excel STDEV and the full population STDEVP functions, and they are pretty close. MS at 2.43 and OSX at 2.04. Having a look at a samples of the CVSS 10's there is a bit of a difference. "The File Bookmark component in Apple OS X before 10.11.2 allows attackers to bypass a sandbox protection mechanism for app scoped bookmarks via a crafted pathname." OK, this one is pretty bad too, allowing an attacker to execute code remotely. This one is a TLS/SSL bug, probably a flow on from SSL bugs found in 2015 in open source libraries and in closed sourced ones such as the Windows bug CVE-2015-6112, and CVE-2015-1637. Though I note both these windows bugs had much lower CVSS scores of 5.8 and 4.3 respectively. A bug in an Apple font library, essentially allowing remote code if the font is called in a specific way, say from a webpage. Similar to the much lower rated CVE-2015-0059 Windows 7 bug. Then there are a few bugs in drivers for apple hardware, Bluetooth, IOAceelerator (seems to be a ram disk card not likely found in most macs), a couple pretty bad kernel bugs and some HID driver bugs. I don't think it is fair that these Adobe bugs are rated 10 for Apple when they aren't even listed on the Windows7 list as they are a third party bug. Some of the other 10 rated bugs also reference OSX's app store. Apps that install from their app store install into a permissions based Jail, essentially protecting the rest of the system from this app. The bugs that were found allowed these apps to break out of this jail... But Windows7 doesn't have this feature for their stores apps so an app installs in whatever context the user is running as (run everything as admin and the app you install can get admin privileges), so really although this is a bug, it is not as bad as simply not even having that protection. MS has an appstore in Windows8 and above... and for a time it was so horrible that I would advise against using it for the foreseeable future. As much as I hate to admit it, MacOSX having more bugs doesn't mean anything, it isn't the number but the quality. Macos had more, yes, but other than that one bookmark bug a lot of them were actually third party code or code that was not likely to be exploited. The Windows7 CVSS 10 bugs weren't that bad either, not too many will have these exposed to the internet, and inside networks all bar the RDP bug will likely not be installed on 99% of machines. I think we would find if Apple ditch support for natively updating Adobe and other third party software then their number of bugs would drop dramatically, account for their supporting directly all their hardware and you can count for the disparity on numbers of bugs. There is more analysis that could be done here too (I will post the Spreadsheet I used in the next post), perhaps MacOSX had more bugs as more were reported, more were actioned and more were reported publicly to open source software library mailing lists were they would make their way to the media and Apple would be red-faced if they didn't jump on patching them. Perhaps MS was scoring their bugs harsher than they needed to be, and submitters of the open source software bugs in MacOSX were scoring their bugs softer due to their bias to support their own code. Security wise I would say they are actually neck and neck, which is I suppose a good place to be for security at large. Not good for Apple-bashers like me, but I will admit when Apple does good things. On to the CVSS scores, I don't think they are doing it right. They shouldn't be giving an optional disabled by default service like Telnet, or an obscure and I assume non-loaded driver like the IOAccelerator on Apple a score of 10. Sure it allowed remote exploitation, but how likely is it. They should probably put these at <9.5, then they are still critical, but this score doesn't black eye the vendor so much. Next they really shouldn't include third party software in one listing and not in the other, you can't compare the two this way it is an (ahem) Apples verse oranges issue.